The 10 Best Bakeries in Delaware! Bakeries in Delaware are a world of oven-fresh diversity. No two bakeries are identical. All of them have a touch of flair. From the artful, to the savory, to the gluten-free, here’s an in-depth tour through Delaware’s bake shops with a highlight on the tastiest 10. Evangelina’s Vegan Desserts is the optimal vegan bake shop. Opened by a vegan mother who initially got the idea creating baked goodies for her kid’s classmates, this spot will satisfy even those who aren’t vegan. Not only does this bakery have scrumptious treats, but they also help out the community by donating food and money to local charities, hold fundraises and food drives, and help to educate the public on veganism. Speaking of specialty diets, this gluten-free bakery is totally worth a visit. It’s the first and only of its kind, after all. This establishment is currently located at the aptly named Good Earth Market but here’s some delicious news—If you’re gluten free, you can find their goods in other places as well. Feel free to peruse their wares at any of the following locations: Drifting Grounds Coffee House, Penguin Diner, the Artful Bean, Frankfurt Bakery, and Living Well Pharmacy. There’s something awe inspiring about a bakery that does deli well. Stop in at this award-winning delicatessen and get a roll, cheese, lunch meat cupcake and Italian cream cake all made fresh and on premise. The ambitious owner is a Kent County native and Delaware Special Olympics volunteer. Her dedication to the community in which she serves her baked goods is as great as the food itself. This well-rounded, beachside bakery puts a Polish twist on their wares and the result is a local, cult following. At the Bake Shoppe in Rehoboth Beach, you’ll find artfully decorated sweets and savory breads baked with love. Doors open promptly at 6:30 a.m. so early risers can start their day off right. This is the hidden gem of Delaware bakeries. The head chef has studied pretty much everywhere, from Texas to New York to Disney World and when it comes to cakes she puts on quite a show, even popping up at flea markets and farmers’ markets with her goodies. The artistic approach to the craft, as evidences in each personalized cake, is something she guards with her heart and apron. If you like the idea of Southern/Caribbean fusion in a bakery, this Wilmington wonder will be right up your alley. Be a kid in a candy store again by heading out to Candy Kitchen’s Bakery and Candy Shoppe in beautiful Rehoboth Beach, Delaware. There’s no place quite like this where the scent of chocolate covered pretzels, hand-rolled fudge and assorted baked goods wafts out over the boardwalk, beckoning beach goers of all ages to set up shop out front. Why out front? Well, if you haven’t seen the lollipop oasis, an outdoor lounge that’s straight out of the Candyland board game and situated just out front of Candy Kitchen, you’ll definitely want to pull up a colorful chair and enjoy. This local flavor-ite has stirred up quite a commotion with their doughnuts. Not only are these doughnuts an ever-changing delight that pair nicely with a day at the beach, but they also come with a clever, simple twist. They’re served hot, right out of the oven. If the thrill of a hot cookies and cream doughnuts served with a piping cup of coffee is your kind of morning, you’ll thoroughly delight in a trip to the Fractured Prune. When it comes to Delaware baked goods, sometimes savory can be oh so sweet. Such is the case at Old World Breads, a coastal delight that’s been crafting a wide selection of decadent artisan breads for upwards from 25 years and counting. Their specialty is Old World bread inspired by ancient European recipes and their products contain locally grown ingredients. Watch them kneed the mouth watering dough together right in front of you by visiting them during their hours of operation, 7 a.m. to 5 p.m. Monday through Saturday and 7 a.m. to 1 p.m. on Sunday. Their Monday day old bake sale is also a highlight. This place really takes the cake when it comes to serving Wilmington sweets. Their win for best bakery in Delaware was well earned. While they specialize in custom cakes and can do amazing art with fondant, (including a pretty awe inspiring “Game of Thrones” cake) it’s the cupcakes that keep the locals coming back. Stop in anytime before 2 p.m. Monday through Saturday. If you can’t decide which desert to dip your fork into, we recommend the raspberry white chocolate mousse cake or their salted caramel cupcake lightly sprinkled in Hawaiian sea salt. At just $3.50, it’s a steal. Bing’s is the longest standing bakery in the entire state of Delaware, a feat that’s near impossible to accomplish due to the staunch competition. Many a favored bakery have come and gone but Bing’s remains a staple of the community. In fact, they’ve been serving up some of the finest baked goods in Newark for decades. Their secret? They’re a bridal party’s best friend. While their pies, pastries and cookies continue to impress, they cater to the wedding crowd and you can really feel (and taste) the love in their sweets. Bing’s Bakery is open Monday through Saturday from 7 a.m. until 6 in the evening. This is just a small sampling of what Delaware has to offer your pallet. Be on the lookout for brand new bakeries as well as restaurants and cafés. Delaware is always breaking ground with new and exciting food. 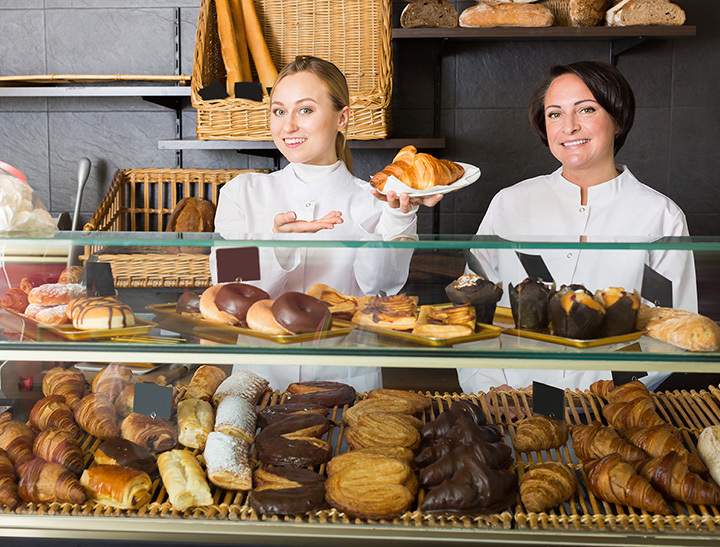 View more Delaware Bakeries and Pastry Shops.